Hand From Above encourages people to question their normal routine instead of allowing themselves to simply rush from one destination to another. 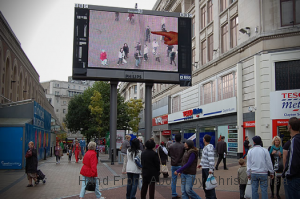 Passers-by will be playfully transformed by a giant hand from an urban screen. Unsuspecting pedestrians will be randomly tickled, stretched, flicked or removed entirely in real-time by a digital deity. Actions change depending on how crowded the scene is or weather conditions. Originally commissioned by the Abandon Normal Devices festival. Chris O'Shea is an artist and designer, creating interactive work for both public institutions and private companies. He creates experiences that playfully challenges our perception of spaces and objects. In 2006 he was the guest curator of the Cybersonica exhibition and in 2007 received a commission for Designers in Residence at the London Design Museum. Clients include AllofUs, ico design, Greyworld, Jason Bruges Studio, Moving Brands, Moritz Waldemeyer and collaborations with rAndom International, Silent Studios and Cinimod Studio. Work has been created for the Leicester Performing Arts Centre, Onedotzero, Royal Opera House, Southbank Centre, Tate Britain, Wellcome Collection and V&A Museum. He is the author of Pixelsumo and co-founder of the event series This happened.